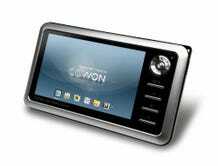 The Gadget: Cowon's A3 portable music player, which supports about as many codecs as its bigger, beefier brother, the Q5W. The difference is the A3 can fit much easier into your pants. The Verdict: Just as great as the Q5W. The A3's got a 800x480 display which is fantastically watchable, and supports just about every codec anyone would imagine throwing at it: DivX 3.11/4/5/6, XviD, MPEG-4 SP/ASP, WMV 9/8/7, H.264 MP, M-JPEG, MPEG 1/2 for video, MPEG1 Layer 1/2/3, WMA, FLAC, OGG Vorbis, OGG FLAC, APPLELossless, AAC/AAC+, AC3, True Audio, Monkey Audio, MusePack, WavPack, G.726, PCM for audio. The video player is smooth (load times are a second or two), but navigation is a little wonky with the 4-way stick taking the place of a directional pad. It's not too bad, but occasional down-clicks for selecting something didn't get registered, or got registered as an up click instead. Photo viewing is also sweet on the bright and ample display, and the transition time between photos is negligible. The only problem comes from the navigation stick and trying to cleanly press down on it without moving the stick in another direction as well.